1. Strong anti-theft, steel chain and U-lock double protection, high safety performance. 3. Alloy steel material, effective anti smashing, anti violence open, anti hydraulic scissors, high safety factor. 5. 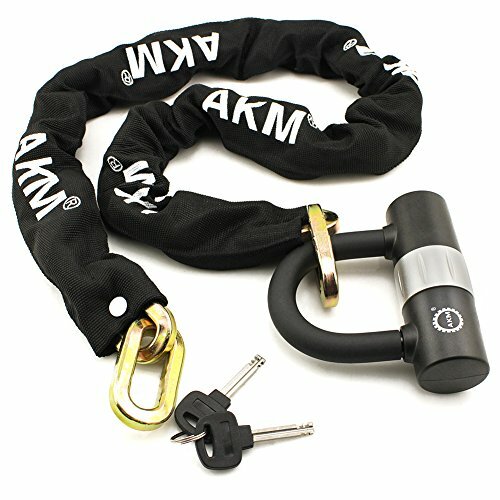 An affordable U lock for moderate crime areas 10 mm hardened steel shackle Reinforced collar over key way for increased protection High security disc style cylinder High security Bent Foot design that are more ergonomic and reduce the amount of torque being applied, to stop them bending or breaking. AKM EU strive to provide exceptional products and services to customers. If any questions or good advices for our products, please feel free to contact us so that we may resolve the issue for you. Strong Protection: 10mm high strength square link chain,Heavy duty tough square-linked.anti-sawing,anti-drill,durable. High Security: Strong locking, Alloy steel, Hardened steel and have double bow hitch in the body of the anti-theft. Resistant to cutting, breaking, sawing and shearing.The chain lock is a perfect solution for protecting your bicycle and motorcycle, ATV or other valuables against theft. A wide range of uses: Perfect for everyone and applicable to motorcycles, electric cars,electric bikes,cars, tricycles, doors, grills, ladders.Ideal for bicycle lock, motorcycle lock, combination lock, cable lock, chain lock, skateboards, sports equipment. Material: non-toxic PVC material and reinforced rust alloy steel chain, in line with EU environmental standards.Nylon sleeve cover provides additional protection and helps prevent scratches on your bike/motorbike. If you have any questions about this product by AKM, contact us by completing and submitting the form below. If you are looking for a specif part number, please include it with your message.